Why you need Service Engineer. Washing machines and dishwashers always appear clean in principle but this is not entirely true. During each wash, crucial (often invisible) components in the machine become soiled with lime scale, soap and dirt. These deposits cause wear and tear to the components, which in turn leads to malfunctions.In the worst case, this will stop the machine from working though other problems can also occur, such as washing which is not properly clean, a washing programme which takes longer than expected, the machine not heating up properly or a continuously operating pump. The best known example of a defective component is the heating element. Even before it actually breaks down, it does not work properly for a while. There are other components which are also sensitive to soiling.The use of HG service engineer for washing machines and dishwashers prevents soiling of filters, floats, drain pipes and other inaccessible components from causing malfunctions in the machine. Sealing rubbers remain elastic and waterproof, so that there is no risk of leakage and short circuiting. All visible components will also become shiny clean of course, so that the machine is not only new on the inside but also looks new on the outside. This is why professional washing machine and dishwasher repair engineers always clean the machine completely after a repair job, in order to be sure that other components will not begin to malfunction in the near future, as the result of soiling. Machine malfunction can also be prevented by cleaning your machine once every three months with HG service engineer for washing machines and dishwashers. This product was developed in co-operation with specialised washing machine repair engineers, and combats malfunctions in washing machines and dishwashers. How to use your Service Engineer. Make sure the (dish) washing machine is empty. Fill the soap tray up to the maximum level with HG service engineer for washing machines and dishwashers. Set the programme to the hottest temperature, start the entire programme directly,and leave the machine to work without interrupting it. 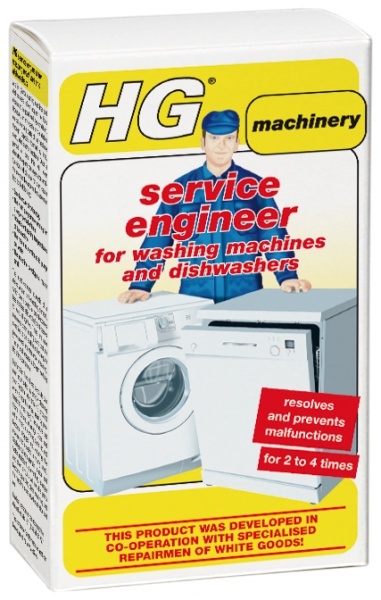 In washing machines, the main wash soap tray or the machine itself should be filled with a full bottle of HG service engineer for washing machines and dishwashers. Do not add extra detergents. Set the programme to the setting for coloureds. Now turn on the washing machine and leave it to work through the complete programme, without interruption.